It is June 4, 2013. The top song is “Can’t Hold Us” by Macklemore and Ryan Lewis featuring Ray Dalton, which from what little I can follow of the lyrics seems to be about hedonistic spectacle as a form of revolution. Appropriately, the song is overlong, but has a nice brass bit near the middle. The top movie last weekend was Fast & Furious 6, and the top movie next weekend is The Purge. You will know doubt be utterly unsurprised to learn that I know nothing about either of them; in my defense, I did watch three movies in May and June that all hit number one at the box office, just not either of these two. In the news, the Obama administration expands sanctions on Iran; the trial of Chelsea Manning–at the time frequently misgendered and misnamed in the press as Bradley Manning–for leaking classified documents in the WikiLeaks scandal begins; and over three million people take part in the world’s largest gay pride parade in Sao Paolo. 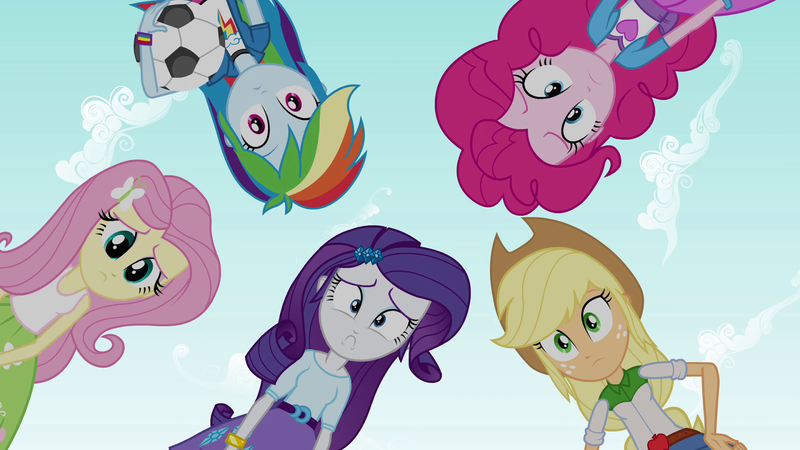 Equestria Girls comes out in two weeks. And, the reason we are discussing this day in the first place, The Elements of Harmony: My Little Pony: Friendship Is Magic: The Official Guidebook by Brandon T. Snider. There is fairly good reason not to tackle this book. It is in many ways the anti-My Little Po-Mo, and official, hardcover, slickly produced, full-color, heavily illustrated guidebook. It is informative, straightforward, unpretentious, and unchallenging; this is not the sort of book whose author likely ever giggled to himself over the tricks his latest entry played on the audience. Which is not to say it is entirely without tricks. The cover of the book is, quite cleverly, designed to mimic (other than the title and the Friendship Is Magic logo) the book which was the very first object seen in the series. The inside of the front cover and the frontispiece are filled with quotes from the show, in different colors, fonts, sizes, and orientations, which is reflected by a similar patchwork of (entirely different) quotes on the last page and inside back cover. The book is an island of order within the chaos of the show, a straightforwardly organized and neatly summarized guide to the messy, mazelike realm depicted by the quotes. Which is to say, it is mostly far less interesting than the show itself. The majority of the book (pages 82-213 of a 255-page book) is taken up by quick summaries of every episode of the first three seasons, and most of the rest is a dramatis personae. 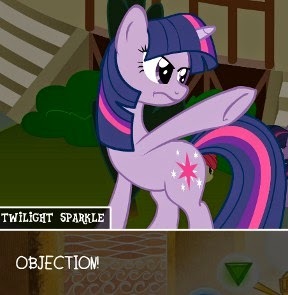 There are occasional quotes from the writers and staff of the show, which can sometimes be quite interesting, and the attempts to quote friendship lessons in episodes that lacked letters to Princess Celestia can sometimes be entertainingly odd (Princess Celestia’s speech quoted in the entry on “Magical Mystery Cure” sums up to “Twilight is great”), the book is sorely lacking in production details or anything else not easily available in wiki form. This is odd, since the only people likely to purchase a book like this are adult or teen fans who probably already have access to the wiki. The book is quite aware of those fans. The final chapter is a strange discussion of the fandom, shifting from the light, children’s book diction of the episode descriptions to a (213-250) patter that would fit right into a press release from Hasbro’s marketing department. Compare “At first, Twilight believed the spell had no effect, but now she knows it accidentally switched her friends cutie marks, causing them to do things they aren’t good at!” to “In a market flooded with animated programs and requisite toy lines, My Little Pony has excelled because of its combination of branding and substance.” Most curiously, although the final paragraph of the chapter is written as if it is the conclusion of an apologia for teen and adult, non-parent fans, the bulk of the chapter talks about the show empowering young girls and being a useful teaching tool for families. It sits strangely within the book, and it is perhaps appropriate that it is hemmed away from the rest of the book by song lyrics on one side, and the quote-maze of the back cover on the other. If we give little girls a respectful treatment of the things they like–if we dare to take it as seriously as they do–we will see for ourselves that it’s not so silly at all. We can truly appreciate the merit they see in it. And, amazingly, we can enjoy it ourselves. This is a silly book. It is an information-light guidebook to a series too simple to require one, easily dismissed as just a cash-grab from deep-pocketed fans in the lead-up to the show’s theatrical debut. But nothing is silly–which is to say, everything is equally silly. If this is a show worth taking seriously–and there are people who take it seriously, so it must be worth taking seriously–then it is a show worth having this sort of book for. June is Derivative Works Month, where I take a break from analyzing episodes of Friendship Is Magic and instead analyze a mix of fanworks and officially licensed works other than the show using the same techniques. uh… factory. That makes rainbows. Pretty pretty rainbows. It’s August 11, 2011. The top song is LMFAO’s “Party Rock Anthem” and the top movie is the surprisingly good Rise of the Planet of the Apes. In the news this week, the Arab League calls on the Syrian government to stop killing its own civilians, which Syria elects to continue doing; noted whackaloon Michelle Bachmann wins the first contest of the 2012 Presidential election, a poll regarding the Iowa and on the day the song was released, the London riots of 2011 ended. Season 2 of Friendship Is Magic is a little over a month away. On YouTube, user WoodenToaster posts the song “Rainbow Factory,” one of the most popular an explosion of brony music that to an extent is still ongoing. (At time of writing, the YouTube posting has over 1.9 million views, 17,000 “likes,” and 300 “dislikes.”) The song is dark, with heavy distortion on both instrumentation and the male singer (presumably WoodenToaster)’s voice. The subject matter is the Rainbow Factory, a feature of the city of Cloudsdale first seen in Season One’s “Sonic Rainboom,” where that city’s pegasus inhabitants convert pools of liquid color into the rainbows they distribute across Equestria. The song implies that there is some sinister secret to the factory; lines like “Now a rainbow’s tale isn’t quite as nice/As the story we knew of sugar and spice” and “In the Rainbow Factory, where your fears and horrors come true/In the Rainbow Factory, where not a single soul gets through” make it very clear that something awful is happening to make these rainbows, but leave precisely what up to the imagination of the listener. However, I am not particularly qualified to analyze music (which is to say, I am even less qualified to analyze music than I am to analyze animation, hard as it may be to believe that such a thing is possible). Fortunately, there is a fanfiction based on the song, and implicitly endorsed by WoodenToast, seeing as the YouTube page for the song links to the fic. “Rainbow Factory,” the story by AuroraDawn, is somewhat less popular than the song: 73,000 views, 2,000 “likes,” and 150 “dislikes.” Still, that is an impressive readership for a fic in a relatively small and young fandom, and an overwhelmingly positive response. Neither the story’s description on FIMFiction nor the story itself link to the song, but the debt is quite clear, not only in the title but in the use of lyrics from the song as section-heading epigraphs throughout the story. However, the story departs from the song quite significantly, mostly by making explicit what the song only implies, as well as by having characters. It is primarily told from the perspective of Scootaloo, now a young adult just out of flight school. As it opens, she is taking her final exam along with a group of other ponies, all of whom believe that ponies who fail their exam are exiled to some distant city. After the first pegasus to attempt the test, Aurora Dawn, injures herself and fails, she is ignored and left to struggle with broken wings. Scootaloo’s friend Orion Solstice attempts the test as well, but abandons it to help Aurora Dawn, earning an automatic failure; this then distresses Scootaloo so much that she is distracted during the test and fails. The three ponies are thus, following an elaborate and seemingly pointless ruse in which they are escorted out of the city by ponies who don’t know where “exiles are sent,” then back into the city by Rainbow Factory guards, shipped off to the Rainbow Factory’s secret levels, where they learn that the most obvious and least interesting possible implication of the song is true: rainbows are made by painfully sacrificing ponies. 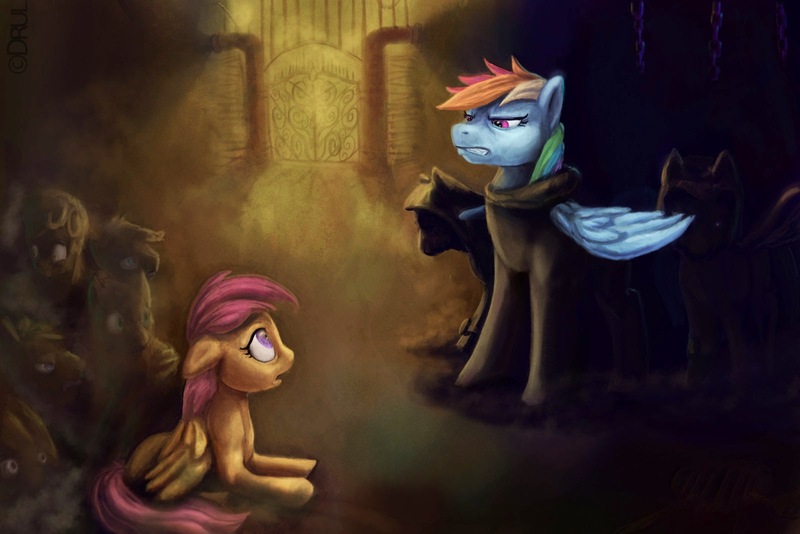 Scootaloo confronts the head of the program, who turns out to be Rainbow Dash, who in turn rejects Scootaloo and all the pegasi who fail the examination as being worthless and unworthy of the high standards of Cloudsdale. Scootaloo and the other two newcomers attempt to organize a mass breakout of the imprisoned pegasi, only Scootaloo makes it back alive, but she makes a wrong turn in her escape attempt and is recaptured and fed into the rainbow machine. One has to act: what is this story for? If its purpose is to shock, it fails; it is fairly predictable throughout, with the only real surprise being Rainbow Dash, and even that is obvious in hindsight: this is a story of adults betraying their children, so of course if the story is told from the perspective of Scootaloo, the adult closest to her has to be the one in charge. The violence, while there is a great deal of it, never feels particularly visceral, and is nothing special for a gorefic, so it fails to be shocking in that sense, as well. Mostly, though, it fails to shock because it is not horrible violence happening to or being perpatrated by characters we care about. The society depicted, in which the culture of Cloudsdale is defined by perfectionism justified by constant repetition of the glory and excellence of Cloudsdale pegasi, bears no resemblance to the Equestria we see in the show, and despite a handwave that years of running the Rainbow Factory has twisted Rainbow Dash’s elitism into extreme hatred of those she sees as inferior, the Rainbow Dash we see defending Fluttershy from bullies in flashbacks in “The Cutie Mark Chronicles” would never work with the factory in the first place. In addition, that the flight school teachers stand by and do nothing for the injured Aurora Dawn, and expect the examinees to do likewise, is utterly unlike the group behavior of ponies as seen in the show. On FIMFiction, this is marked as an “alternate universe” story, presumably in acknowledgment of precisely those issues–these don’t act like our Rainbow Dash or our pegasi because they’re not. These choices, or at least choices like them, are probably necessary. It is difficult to imagine a scenario in which the Rainbow Factory could have a dark and violent secret without at least some contradiction of the Equestria and characters depicted in the show. But unfortunately that means that these are not the familiar characters, and so the story cannot simply assume that we care about them before it starts slaughtering them. These aren’t the Rainbow Dash and Scootaloo in whose adventures I’ve become invested through years of watching the show; these are conglomerations of words who happen to have the same names and physical descriptions. Which then raises the natural question raised by any alternate universe story: Why bother? Why not write an original story about original characters, rather than fanfiction with only a tenuous connection to the original work? For that matter, why bother with pony grimdark or gorefic to begin with? Certainly, if one has a taste for violence and darkness, they can be found in abundance in other media, so why add it to one of the few works where they are largely lacking? A somewhat more generous reading is available, however, if we consider the theory of the grotesque. First explored by the critic Mikhail Bakhtin in the middle third of the twentieth century, the concept of the grotesque is intimately interconnected with another of Bakhtin’s concepts, the carnivalesque or carnivalization, which in turn is one of the core elements of postmodernism. One can thus argue that the grotesque is, in a sense, a mostly latent part of Friendship Is Magic‘s DNA, waiting to be activated in fanworks. The grotesque is essentially a form of satire, using the distortion of the human (or in this case, pony) form to degrade that which is usually elevated, dragging the high down to the low. This is part of the aesthetic of carnival, in which social structures and ideologies are torn down and chaos and humor reign. The contradiction of the show’s values within the story can thus be read as deliberate, part of this process of tearing down in order to achieve a carnivalesque state in which those values can be interrogated. But again, this violence is not occurring within something recognizable as the show, so whose values are it questioning? What authority is brought down and satirized by this grotesque violence? The answer may lie in another question: In what community might one receive constant messages celebrating and asserting the excellence of all individuals in the community, while at the same time knowing that those who fail those standards of excellence will be thrown out? A community, further, devoted to the creation of a product, and which one must belong to or else be considered worthless and deserving of death? Worded that way, it should be fairly apparent: this is not the Cloudsdale in the show because it is the Cloudsdale Corporation. The satire is not of the show as a work of art, so much as it is a satire of the show as a corporate product. The values being brought down are thus not actually the values of the show, but of Hasbro and all entities like it: profit, the mechanization and dehumanization of workers into human resources, and the greedy devouring of those resources by a system that is overseen and governed by the powerful elite but appears capable of acting on its own. Rejected by the system for failing to measure up to arbitrary standards, the young adults of corporatist Cloudsdale are discarded as worthless. No one much cares what happens to them, and indeed the powers that be believe they deserve to die. This is exaggerated and melodramatized, certainly, but at the same time it is a rough description of how our society treats the unemployed, and the recent graduates who are both the most likely demographic to be unemployed and the most likely demographic to be bronies. Other readings are of course available; this is simply an example of one. It is in the nature of the carnivalesque to tear down all ideologies, and the grotesqueries contained within can thus be read as satire of almost any aspect of society, according to the ideology of the reader and their preferred targets. The grotesque is thus, in a sense, a mirror held up to the reader. Mirrors can be valuable things, so despite being distasteful, somewhat boring, and in need of a good proofread, a myriad of redemptive readings of the story “Rainbow Factory” are available. Or just listen to the song, it seems like it’s probably a good example of whatever genre it is, if that genre is your thing.